Starring: Frank Grillo, Elizabeth Mitchell, Mykelti Williamson, Joseph Julian Soria, Betty Gabriel, and more. In 2013, Hollywood and James DeMonaco introduced the world to a concept that some may fear and some may dream of; the concept of a purge. The first purge introduced audiences to one night where for twelve hours, all crime is legalized, including murder. The first was a thriller film based in one single house and has since blown up to a city wide experience of what human nature could turn to if they had one night to do anything that they pleased with the sequel in 2014. 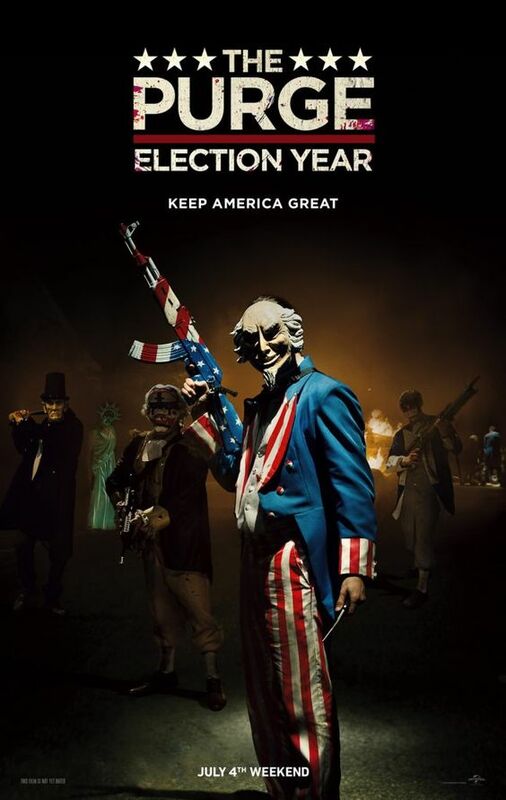 Now, in 2016, we have the third piece of the trilogy in ‘The Purge: Election Year’, as the plot thickens and the annual purge is at risk of being ended through the election of a new president. Can the third film continue the intensity and violence that its predecessors has done so well at giving audiences? The day has come and purge we shall…. Well… They will, not us…. Do not do it, you will get arrested. Ok, let us do this. ‘The Purge: Election Year’ brings what could possibly be the end of the purge, close to reality. A senator by the name of Charlie Roan (Elizabeth Mitchell), is running as the independent candidate for the presidency. Her goal is to bring an end to the purge due to losing her family during a purge night. During her campaign, she masses up large amounts of followers but also large amounts of opposition. In charge of protecting her from said opposition is Leo Barnes (Frank Grillo). Leo heads the protection team for Senator Roan but is suddenly faced with an even more difficult task than the job already seems to be as a new rule is introduced with purge night, thanks to The Founding Fathers: Government officials are no longer granted immunity during purge night. A rule that seems to be targeting the woman that could end the purge entirely. As Leo creates a fortified shelter for the senator, his efforts are laid to waste as an insider sells them out and the senator and Leo are faced off with people of the purge and a highly trained task force attempting to capture the senator and surely end her status as a threat to purge night. The third installment of The Purge series was the icing on the cake for me that solidified my enjoyment of this trilogy. Since the first came out, I have thoroughly enjoyed the brutality these films presented to the audience and myself. Being possibly the weakest of the three, the first still was memorable for me. With the second, DeMonaco broadened the scope, added more plot, and kept the brutality and insanity. Now with the third, the plot hits its climax and the terrifying imagery hits a new high as well as the brutality of the kills and sheer insanity that the purge night brings. I love Frank Grillo and his presence radiates badassery and this film lets him be just that. Elizabeth Mitchell played a convincing politician driven by passion to end the purge. Yet on the flip side of the coin, The Founding Fathers are as sadistic as the night they created. The supporting actors within the film, Mykelti Williamson, Joseph Julian Soria, and Betty Gabriel, carry the movie very well, in my opinion and are enjoyable to watch with their story and also their slight comedic relief at times. Overall, ‘The Purge: Election Year’ brings back everything I love about this series with its intensity, brutality, and terrifying imagery. For a film that relies on brutal violence, The Purge does a good job at bringing in a plot that does not feel too forced unlike the first film where it relied solely on the horror thriller feel of it. If you love films with violence, profanity, and intense scenes, this is the film to see. If you love the series, this is the best one to see of the three.